As a city that seems to float in the margin between Europe and Asia, removed by a lagoon from the tempos of terra firma, Venice has long seduced the Western imagination. Since the 1797 fall of the Venetian Republic, fantasies about the sinking city have engendered an elaborate series of romantic clichés, provoking modern artists and intellectuals to construct conflicting responses: while some embrace the resistance to modernity manifest in Venice’s labyrinthine premodern form and temporality, others aspire to modernize by “killing the moonlight” of Venice, in the Futurists’ notorious phrase. Spanning literary, art and architectural history from John Ruskin, Henry James, and Ezra Pound to Manfredo Tafuri, Italo Calvino, Jeanette Winterson, and Robert Coover, Killing the Moonlight tracks the material and ideological pressures that modernity has placed on the legacy of romantic Venice—and the distinctive strains of aesthetic invention that resulted from the clash. Whether seduced or repulsed by literary clichés of Venetian decadence, post-Romantic artists found a motive for innovation in Venice. In Venetian incarnations of modernism, the anachronistic urban fabric and vestigial sentiment that both the nation-state of Italy and the historical avant-garde would cast off become incompletely assimilated parts of the new. 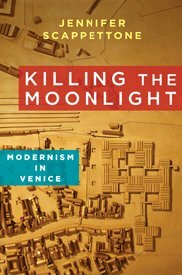 Killing the Moonlight brings Venice into the geography of modernity as a living city rather than a metaphor for death, and presents the archipelago as a crucible for those seeking to define and transgress the conceptual limits of modernism. In strategic detours from the capitals of modernity, Scappettone charts an elusive "extraterritorial" modernism that compels us to redraft the confines of modernist culture in both geographical and historical terms.